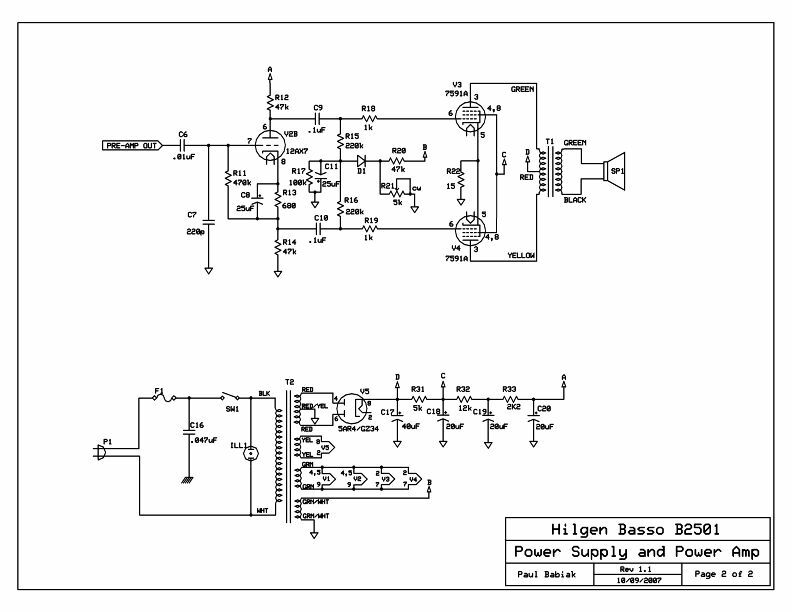 Another amazingly detailed schematic by Jack Hester, who I introduce below in the text following the second schematic of the Model HM-B "High Quality Amplifier." After studying the circuitry of the HM-B (and perhaps, to a modest extent, after reading the material on this website), Jack became a card-carrying Hilgenite by acquiring a Model T-1506 Troubadour. 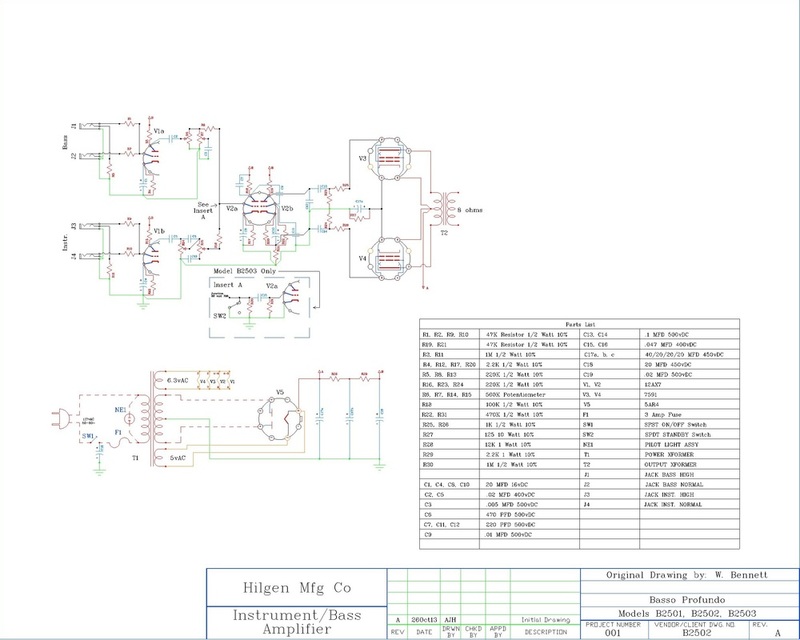 He applied his extraordinary electronic expertise and drafting skills to his own amplifier to produce this schematic. 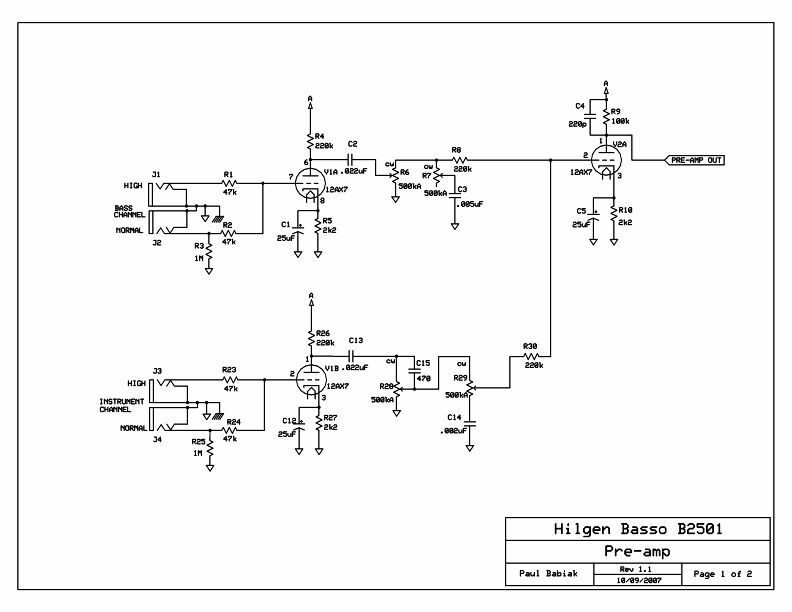 MODEL HM-B "High quality amplifier"
This schematic has been floating around the Internet for several years. I am not certain of its source. However, the font and irregularities in the stamped "B2234" are identical to those of the stamp used to mark Hilgen chassis. For example. my HM-B has "B2245" stamped in black ink on the chassis. It is my working hypothesis, based on an on-going comparison of code stamps, that the last number signifies the year in which the stamped object was produced. 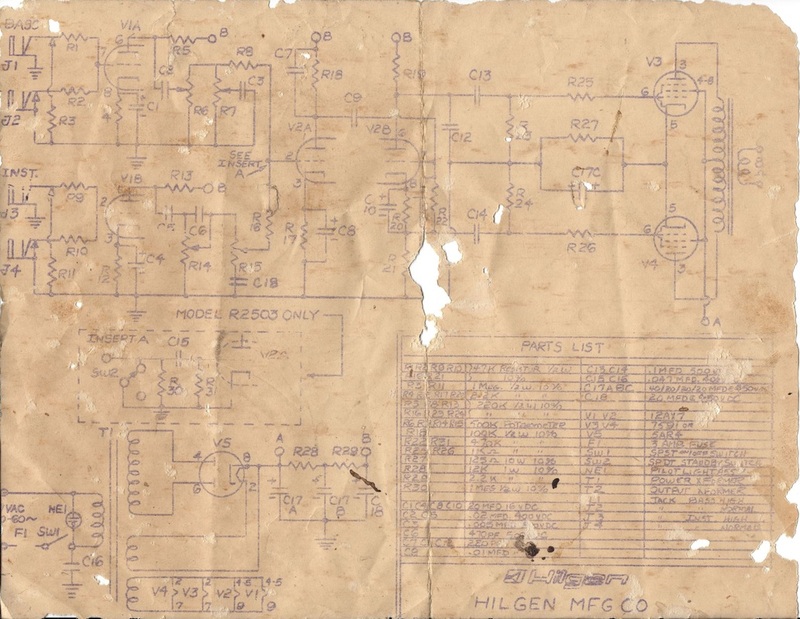 Hence the schematic was almost presumably drawn in 1964, which would be consistent with (a) the currently-known history of the Hilgen company and (b) all the detectable codes on the HM-B indicate that the chassis was completed in 1965. 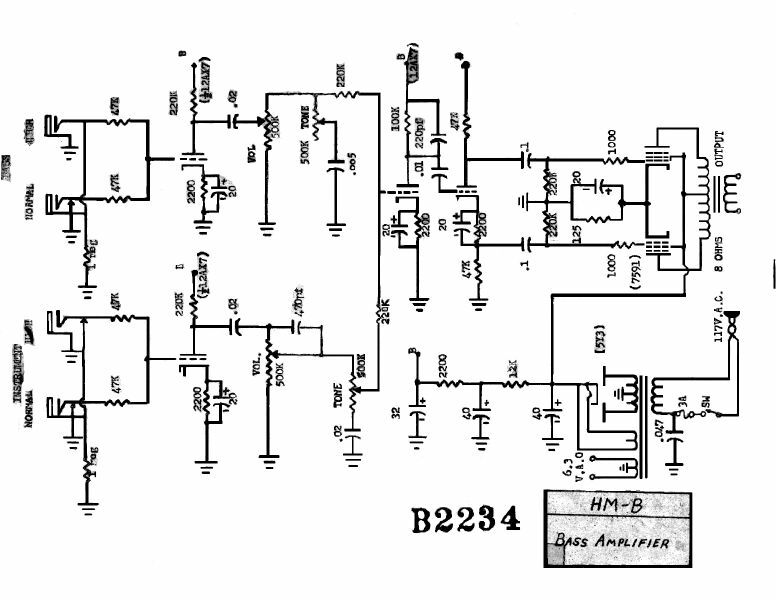 I was grateful to have this schematic, because someone had rewired my HM-B to use 6L6 power tubes instead of the 7591's, and an unidentifiable rectifier tube in place of the 5Y3. It would have been helpful if the schematic had included tube pin numbers, but I figured that out through spec sheets that are readily available on the Internet. However, I then had the remarkable and fortunate experience to be contacted, through this site, by Andrew "Jack" Hester. Jack began his electronics training in 1971. Courtesy of the U.S. Selective Service, Jack continued his education while on military duty assigned to missile defense, finally finishing his training as a civilian. While innocently applying his training in the power-generation industry, a talented guitarist friend, Don DeJong, turned him on to the seductive world of tube amps. Jack soon began to exhibit the classic symptoms of malamphilia: hoarding of broken-down amps to be brought back to life "someday" and helpless attraction to hieroglyphic depictions of circuitry, exacerbated in Jack's case by a weakness for CAD drawing. Only those of us who share Jack's malady can appreciate both the challenges and rewards he encounters in day-to-day life. Jack took the time to review the 1964 schematic and noticed that the inputs could not have been drawn correctly. I had not thought to question the accuracy of the 1964 schematic, given its apparent originality. Jack gave me detailed instructions on how to draw, from my actual HM-B, what the wiring actually was, and also how to measure (safely!) the output voltages from the power transformer. The result is the schematic below which, ironically, is more accurate and detailed than the 1964 version. It is difficult to suppose that Jack Gentul himself would have drawn the schematic incorrectly...however, we all-- without exception -- make mistakes despite our expertise and best intentions. Jack's intervention is precisely the sort of collaboration that I had hoped this site would promote. He denies having any expertise, but it's all relative. I think he's a genius. Another outstanding example of good people helping this site serve its purpose. I obtained this schematic on May 24, 2013 from (1) my friend, master guitarist, and former bandmate Timothy H. Boulette, who obtained it earlier on May 24, 2013 from (2) Clint Alger, alias "Baron Von Machinenmann," a Hilgen sympathizer and full-time Marshall-mage who runs the wonderful "Vintage Amps Forum" at www.plexipalace.com; who obtained it on November 23, 2007 from (3) Paul Babiak, who evidently is a damn good electronics analyst and draftsman. Model 2502 "Basso Profundo" and 2503 "Basso Grande"